NORWALK, Conn. – Last fall, Norwalk Board of Education Chairman Mike Barbis urged BoE members not to attend the annual Norwalk NAACP Freedom Fund banquet because NAACP leadership made what Barbis described as “very serious false allegations and attacks” on the Board and administration. NancyOnNorwalk learned of the request while looking into a tip that Norwalk Branch NAACP President Brenda Penn-Williams was removed from the school substitute list shortly after a contentious back-and-forth with Barbis at the Sept. 25 BoE meeting. 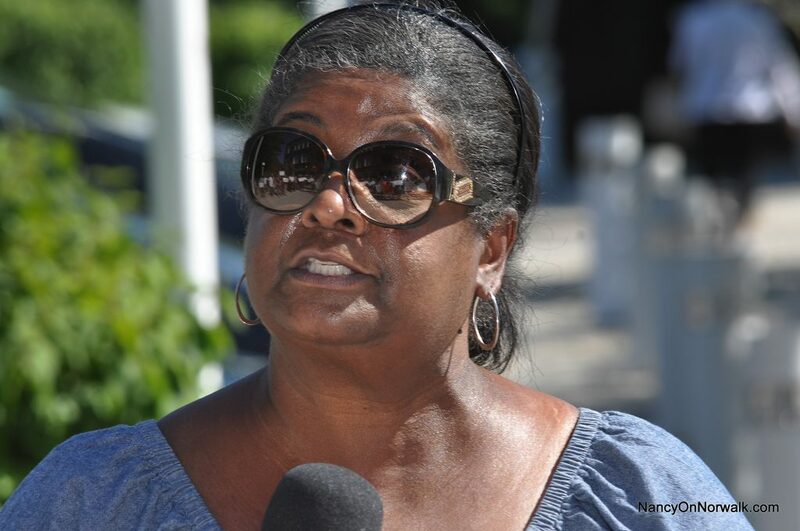 Penn-Williams on Jan. 21 confirmed that she’d been removed from the list and alleged that Barbis had told BoE members not to go to Martin Luther King Day events. None had attended the MLK events, she said, and only one attended to the NAACP’s Oct. 19 Freedom Fund banquet. But Barbis on Oct. 5 emailed the Board to “urge all board members to not attend the chapter’s dinner event this year.” NoN obtained the email through a Freedom of Information Act request. “Considering the leadership at the local NAACP chapter and their history of making very serious false allegations and attacks on the BOE and our staff, I would urge all board members to not attend the chapter’s dinner event this year. No members of Central Office staff will be in attendance,” Barbis wrote. Later that month, Penn-Williams spoke at a rally in support of then-West Rocks Middle School Principal Lynne Moore. She alleged that the BoE Executive Committee had a vendetta against Moore and that teachers were told they couldn’t attend the rally. She slammed NPS Chief of School Operations Frank Costanzo for his legal problems. At the time Costanzo was a defendant in a lawsuit against the New Haven Board of Education which alleged that Costanzo sexually harassed an employee while he was principal of a high school there. The suit has since been settled. Penn-Williams said he was unfit to supervise employees in a disciplinary capacity. “It has come to my attention that a request was made to (inactivate) my status as substitute teacher,” Penn-Williams wrote to NPS Chief Talent Officer Javier Padilla and Adamowski on Oct. 1. She requested a detailed written explanation. Penn-Williams sought to arrange a meeting with Recruitment & Talent Manager Stephanie Garrett to discuss the situation, emailing her at 12:40 p.m. Oct. 4. Garrett attempted to recall the email at 4 p.m., but Penn-Williams had already read it. “My behavior was not disruptive and has never been disruptive. If that had ever been the case, a meeting in HR would have been scheduled,” she wrote. She asked about an appeals process. Penn-Williams on Jan. 21 told NancyOnNorwalk that she chooses to limit her substitute activities to Norwalk High School, and has declined work at a middle school. NoN’s FOI request did not turn up any emails showing that Barbis communicated with administration members about Penn-Williams’ status as a substitute at Norwalk High School, and Norwalk Public Schools Communications Director Brenda Wilcox Williams denied that Penn-Williams was taken off the substitute list due to the Sept. 25 public argument with Barbis. “If I was making a scene, you’d know it,” she said to NancyOnNorwalk, calling Norwalk Superintendent of Schools Steven Adamowski “a big liar” and asserting that she did have an appointment at NHS. She first wrote to ask why she was taken off the substitute list on Oct. 1. Wilcox Williams did not answer a question asking if there was an appeals process. “I don’t have enough money to sue them,” Penn-Williams said on Jan. 21. NancyOnNorwalk emailed BoE members on Jan. 22, explained Penn-Williams’ accusation and asked if they’d been told not to attend NAACP events or the Martin Luther King events. The women responded, the men did not. Julie Corbett, Sarah LeMieux and Heidi Keyes said they wanted to go to the MLK events but had other commitments, including parenting. They said nothing about NAACP events. Adamowski attended the MLK commemoration event held at Norwalk City Hall Jan. 21, sitting on stage next to Mayor Harry Rilling. “Unfortunately, I had a cold and couldn’t attend any events yesterday. As Board Liaison to the committee, I was disappointed that they never made any effort to reach out to me regarding the event. I tried to reach out starting in December. Norwalk Public Schools would have been proud to host the event. NoN put in an FOI request, seeking all emails from Barbis to the Board and/or school administrators that pertained to Penn-Williams or the NAACP, between Sept. 25 and Oct. 19. On Oct. 4, an email notified the Board that NPS would not be buying a table at the Freedom Fund Dinner, as has been past practice. “The national-level NAACP is an organization with a storied history, with great past leaders such as Medgar Evers, Roy Wilkins and Thurgood Marshall. But not every chapter of the organization has a storied history, and sadly, Norwalk’s tiny chapter lacks one. Considering the leadership at the local NAACP chapter and their history of making very serious false allegations and attacks on the BOE and our staff, I would urge all board members to not attend the chapter’s dinner event this year. No members of Central Office staff will be in attendance. “My view is that the BOE should not give any implied endorsement to an organization’s chapter whose leadership continuously slanders our school system, the Board and its employees. I have attended this event myself in the past, but can no longer do so given its current leadership’s actions. “That’s my two cents. Obviously it’s a free country and members can do as they please, but my personal recommendation is that we avoid this dinner until the NAACP leadership shows some basic level of civility and honesty in its interactions with NPS. “If I am slandering the BOE and NPS why don’t they take me to court,” Penn-Williams asked in a Tuesday email to NancyOnNorwalk. “Why would I ever say anything or issue any ‘directive’ like that? “The Board is swamped working on our operating and capital budgets ‎– which is a full time job — as well as the Healthy Start Time task force, a wide range of Policy, CURRICULUM and Facilities initiatives…. all communication between Board members from me regards these matters. I don’t have the time or bandwidth to tell Board members what events they should or should not attend. no one should tell anyone where to go or not to go. As I am not involved with NAACP or even gone to any other their events, etc… I cannot comment on them. As for Barbis, he is receptive, yet was not able to help when I have reached out to him regarding a few NPS concerns I had & have. I think NPS Board should focus on the issues at NHS restrooms, the SPED systemic complaint… and anything else I might not be aware of. the closed Roton MS Success Program, it is soooo exhausting to keep up. Sadly Mr. Barbis told others not to attend the NAACP Freedom Fund Banquet this year. I was humbled and honored to receive their Community Service Award that evening along with Novelette Perkins and Carver Foundation receiving the Corporate Citizenship award, and Bobby and Mimi Burgess their Community Leadership Award. All of us over the years having contributed to the betterment of Norwalk Public Schools. The Keynote Speaker for the program was Marilyn J.Ward Esq. Professor of Law, Quinnipiac University. Her topic…”Defeat Hate…Vote” I think that speaks volumes with this story. Wow! Mike Barbis, this is serious. How could you tell others not to go to this event when you are thechair of the BoE? Are you a fake democrat? You are supposed to represent all of the students in Norwalk. No body should be surprise by what’s going on there Ms Mosby have been pointing issues for years. May be someone should start a student group that look into this type of problems, it’s a lot of lying going on. Time will tell it, ( watch).